Mantralayam, Aruna Sairam’s residence, looks like a cheerfully resolute chunk of butter in the Chennai heat. Step in and a framed four-ft line-art painting of Krishna greets you in the drawing room. The décor is tasteful, traditional elegance. Much wood, understated colour. Sairam calls out a greeting in her unmistakable tenor. She is polite, and an easy conversationalist. She inquires after a common acquaintance, requests a little time to prepare for the photo session, offers coffee, and disappears for a bit. After the photographer arrives, she glides back in, resplendent in a blue saree. “I picked something a little more contemporary. Not my usual Kanjeevaram,” she says. The lensman loves it and begins to click away. She is gracious, and endearingly amenable. 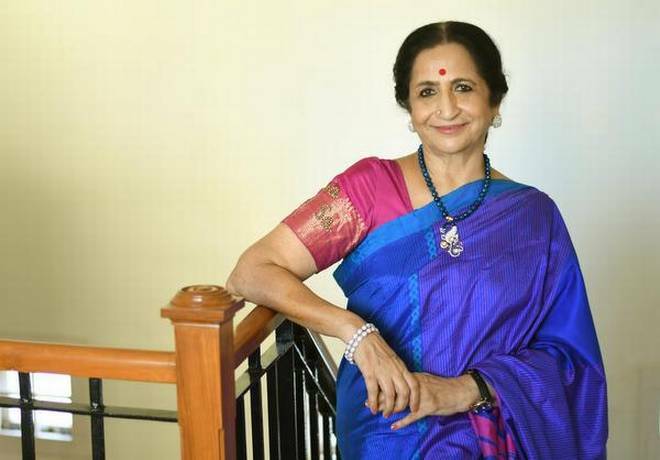 Padma Shri Aruna Sairam has been selected for the Sangita Kalanidhi award, the highest recognition in Carnatic music, this year. It is an interesting and revealing choice by the century-old Music Academy, which has often been criticised for its parochialism. This year’s award not only thrusts the Academy into refreshing territory, it is a thumping validation of Sairam’s prodigious musical spectrum. Apart from her classical Carnatic core, she has managed to embrace various other genres of music, including the Marathi abhang and the bhajan. She has also, through highly selective collaborations, taken her art global without any loss in meaning or melody. The journey has been long and far from conventional. That maiden trip to Germany was in 1987. Sairam was a married 35-year-old and a mother of two then. This was an unusually late start, considering most artists take the plunge when barely in their teens. Sairam’s parents filled their modest 650 sq.ft. apartment in Mumbai with a love for music, and it became a roost for the finest artists of the time. The walls in those railway quarters might still hold echoes of Ustad Amir Khan, Thanjavur Shankara Iyer, T.R. Mahalingam, Ariyakudi Ramanuja Iyengar, and Madurai Mani Iyer. And not just musicians. The legendary danseuse Balasaraswati, towering scholars like K.V. Jagannathan, Harikatha expert Embar Vijayaraghavachariar, Pulavar Keeran, Bhagavatam exponent Sukha Brahmam, and many others frequented their home. “To love one art form is great, but to be able to appreciate another and find those lateral connections, is priceless. I need to feel the import of the words, the flow of the metre, the weight of a consonant. My music is never isolated,” Sairam says. She credits her gurus — beginning with her mother, and the train of artists and mentors who taught her — for not just the technical instruction, but for broader lessons that sweetened life off stage. “Brindamma (T. Brinda) taught me to absorb music with all of my being. There were no teaching aids, no notes. We were riveted to her, we didn’t want to lose even a drop of that fountain of music. I represent her school of music, but I also hope I have absorbed her inimitable decorum.” When Brinda was unavailable, S. Ramachandran kept Sairam’s tutelage afloat. “He gave me the courage to handle ‘apoorva’ or unusual ragas, which give artists the jitters,” Sairam says. At one point, life became overwhelming. Her mother had passed away, ‘Brindamma’ had stopped teaching, and she was herself a mother burdened with unending responsibilities. It was then that A.S. Mani came into her life. “According to the world, I was fine, but I was struggling to find purpose. He helped find my identity — musical and otherwise,” Sairam says. ‘You are not giving me anything new,’ he said. It stung. She asked him to show what more meant. He sang and she wept. A new door had opened. Years later, when she had begun performing, K.S. Narayanaswamy, another great musician, took her under his wing. Finishing school, if you will. “What I learned from him was the logic behind the magical oscillations, or gamaks, that typify Indian music. Until then, I didn’t understand why the Carnatic gamakswung quite so much. He showed me that the range of micro notes in a gamakare defined by the distance between one note and the other. He would make me ‘draw’ the gamaks on paper. I had heard oscillations all my life, but now I began to see them.” She illustrates this with an unforgettable snippet of Todi. “I am overcome by gratitude for my parents and my gurus, who never pushed me to perform. As a student, my innate creativity remained unbridled and as a performer, I was able to channelise the vicissitudes of life into my art,” she says. The whole thing is backed by rigorous rehearsal. “Only when you’ve put in work can you stand your ground while having a musical conversation,” Sairam says. This ‘work’ that goes into building a performance has become a quintessential part of Sairam’s journey. “This is an introverted art. It’s niche. If we are to ever hold and grow an audience, we must care about them, and build layers of appeal and expertise into it. This cannot be done by the artist alone, whose job it is to disappear within herself during a performance. It needs craftsmen who can work on how it looks and sounds, how it is produced and distributed; and coaches who will help calibrate a performance and bring it all together,” Sairam says. The Sangita Kalanidhi is a happy validation of Sairam’s life and struggles, but “it also entails an important responsibility — to record, document, and share,” she points out. More important, the award bequeaths her with an unintended legacy — the classical fan’s intolerance to eclecticism. Sairam has not been immune to misdirected fan rage, but if anyone can ride that wave with ease, it is she. The former journalist now works as a content consultant in fintech and crypto-economics.